1. Self-reflection and focus: “An issue doesn’t stop after a film is released - you have to give it legs,” according to Chip you should choose a topic that’s important to you and stick to it! Creative professionals have a unique opportunity, skillset, and responsibility to: engage in debate, raise awareness, and stimulate positive change on both a local and global level. 2. Understand & Participate: “Research, networking and participating at the most basic level will give you insight and point you in the direction to like-minded organizations and individuals who share these goals.” Whether it’s halting noise pollution in our oceans or making ballot language more understandable, it is essential to become civically involved to some degree. During previous election cycles, Imaginary Forces has hosted a weekly Otis class at the studio to produce animated videos aimed at distilling California Propositions, making the information more understandable for voters. That class helped create “Birdee,” Culver City’s voting mascot, and after implementation saw increased voter participation on the next ballot! 3. Right brain & Left brain: In creating Sonic Sea, a diverse network of professionals had to come together to obtain, understand and visualize the millions of lines of data necessary to support the film and its cause. By collaborating, people in different fields converged for a common purpose. See this video explaining how millions of lines of data was turned into some beautiful (& easily understood) animations on shipping routes all over the world. 4. Giving and Receiving: Giving can involve the contribution of time, effort, risk or money! However, “receiving is not why you are doing it, but receiving is a guaranteed by-product of giving.” Invaluable opportunities can arise from giving from a selfless place. Chip spoke about how Heitor Pereira, the music composer for Sonic Sea, contributed his time and music to the project because of his love for the ocean. "We were thrilled to have the opportunity to work with such a talented composer, and as a result of his generosity, Heitor came away with an Emmy for Best Sound & Music. How awesome is that!" Chip said teaching at Otis was always his favorite day of the week, and credits the sense of community at Otis at what keeps him involved and coming back. 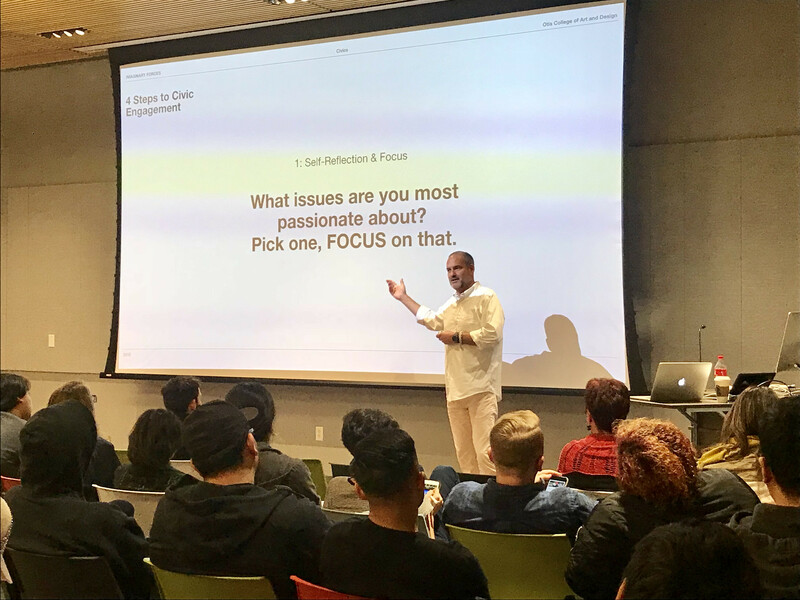 He wrapped up his talk with a brief Q&A discussion with the students, tracing the origins of IF and what it took to start a creative studio. He stressed the importance of having a mentor, listening to experts and understanding their world in order to accurately express their message. Now big or small, get out there and think of ways you can get involved!